To view our current inventory of Civil War and earlier Militaria, click here! This Fine Revolutionary Relic Has Been Sold. 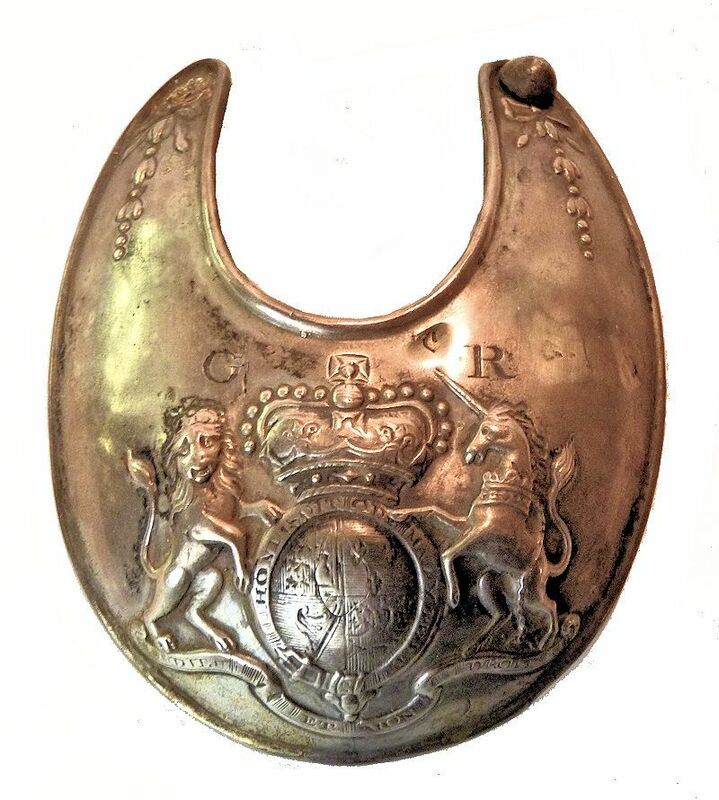 Presented is a Silver British Officer's Gorget of around the late 18th century made from British silver. The body has a royal coat of arms with GR embossed referring to the reigning monarch, King George III (1738-1820). The back is lined with red Morrocan leather. CONDITION: The plate has some minor marks of age, the most significant is a 1/8th inch irregular dent just to the left of the "R", all the others are too minor to mention. On the reverse, some of he red leather has darkened with age. One round button on the font and two small metal eye bolts, one on each side at the top rear are missing from the back. They were used to attach the neck chain or ribbon for wearing from the neck. 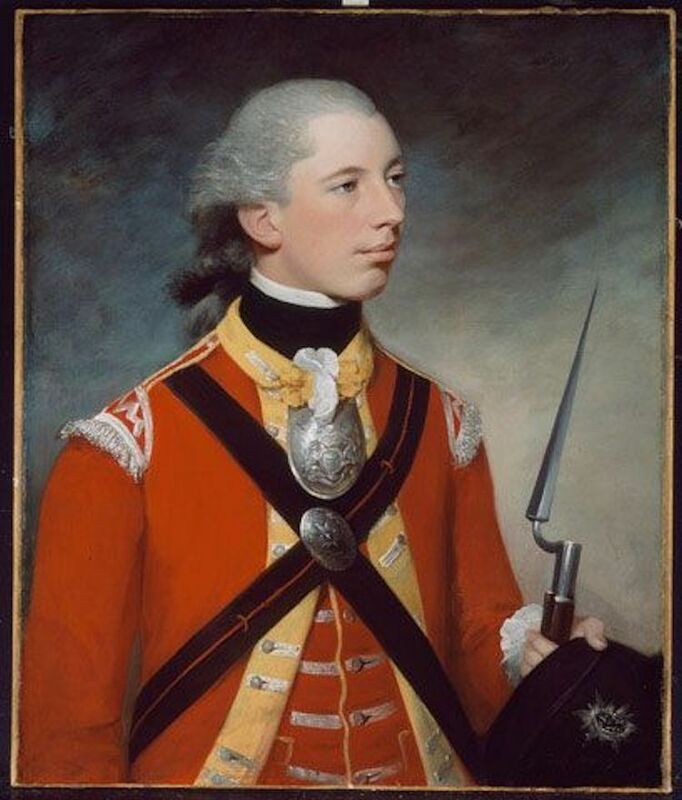 This painting is of Captain Thomas Hewitt, 10th Regiment of Foot, 1781 by William Tate (1748-1806), shows as a mark of his status as an officer, a silver gorget around his neck. The 'wings' on the shoulders of his uniform distinguish him as a member of a light company; his light infantry cap is held in his left hand. He carries a fusil or light musket - a weapon frequently carried by light company officers which was usually privately purchased. Portraits of officers carrying such a weapon are rare. 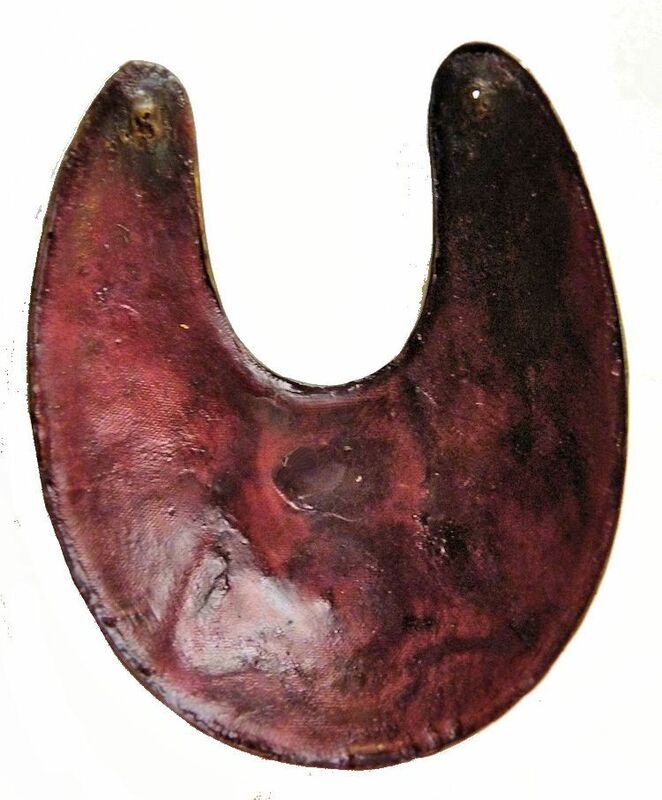 GORGET'S HISTORY: A gorget is derived from the French gorge meaning throat, and was originally a band of linen wrapped around a woman's neck and head in the medieval period, or the lower part of a simple chaperon hood. The term subsequently described a metal or leather collar designed to protect the throat, a set of pieces of plate armour, or a single piece of plate armour hanging from the neck and covering the throat and chest. Later, particularly from the 18th century onwards, the gorget became primarily ornamental, serving only as a symbolic accessory on military uniforms, designating "Authority" a use which has survived in some armies through WW II. During the 18th and early 19th centuries, gorgets of silver or silver gilt were worn by officers in most European armies, both as a badge of rank and an indication that they were on duty. These last survivals of armour were much smaller (usually about three to four inches in width) than their Medieval predecessors and were suspended by chains or ribbons. In the British service they carried the Royal coat of arms until 1796 and thereafter the Royal cypher. OUR UNCONDITIONAL NO NONSENSE GUARANTEE: If not completely satisfied with your purchase it may be returned, if without damage, within five days of receipt in its original packaging. Return items must be insured for their full value. Only a prior email authorization by us for the return is required. Shipping charges within the continental United States are included in this offer if the error is due to our fault. Copyright 2015 Land And Sea Collection™. All Rights Reserved!